Use a kitchen towel to hold an oyster firmly. 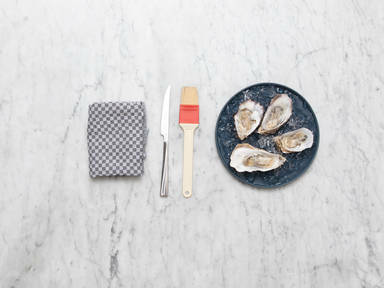 Insert a knife at the joint end and pry the oyster open, sliding the tip of the knife between the shells and lifting the top off. Use a pastry brush to remove any stray pieces of shell from the inside. Use the knife to loosen the oyster from the bottom of the shell, being careful not to puncture the meat. Transfer oysters on the half shell to a bowl or plate filled with ice. Serve with lemon wedges and enjoy!